Summer is the time for day camp and plenty of snacks in lunch boxes. Although it's not nearly has high pressure as making a lunch for school every day, I try to make it a little more fun and add something unexpected into their meals. 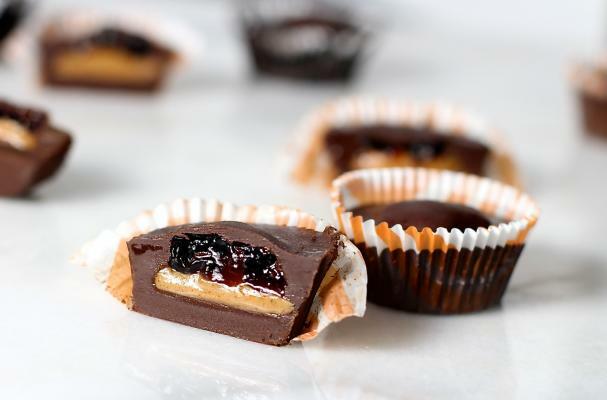 Homemade Chocolate Peanut Butter and Jelly cups are a fast treat that are perfect for tucking into a lunchbox, right next to the chill pack. My kids love it when they see a homemade piece (or two) of candy. Check out this recipe for a quick and easy homemade candy, just right for an afternoon surprise. 1 Prepare 24 mini cupcake liners on a baking sheet sized to fit your freezer. Note: You will need a total of 2 hrs of chill time for this recipe.